India is the second stronger and fast moving economy after China in Asia region. India ranks at the eleventh in the world for its GDP economy and the third largest by purchasing power parity in the world. While the European Union and the U.S. are facing their huge financial deficit crisis, India begins to show its weak sign while trying to struggle with its slow economic growth since early this year. Apart from that, the Indian government also experiences with its financial problems in the country, a similar financial crisis situation in Greece. 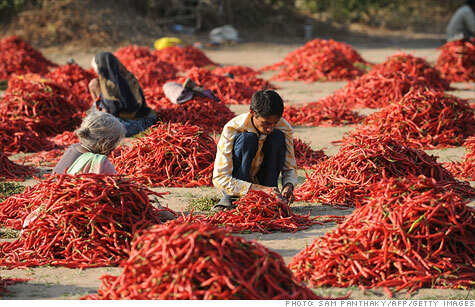 The drastic depreciation on Rupee currency causes a high inflation rate in India. Currently, India's inflation rate has risen up to 7.23 percent, which is higher than China's inflation rate reported at 3.4% (based in April 2012 report) and Singapore's inflation rate at 5.4% (based on the recent news in May 2012). The value of Rupee currency is plunging sharply by 19% against the dollar in the past year, creates a lot of tension for the people in India especially the sudden price hike of fuel by 11 percent and the rising of food prices mainly due to weak Rupee. In the mean time, India is planning to amend its 50-year-old tax laws that would back date tax claims on overseas deals involving local assets which will jeopardize the country's investment economy while many foreign companies may consider moving out from India due to sudden change on the tax policy.There are some major projects including rail projects are pending by the Indian government due to budget constraint. India’s economic growth weakened to a nine-year low last quarter, hurt by an investment slowdown that has undermined the rupee and jeopardized Prime Minister Manmohan Singh’s development agenda. Bonds climbed and stocks fell. Gross domestic product rose 5.3 percent in the three months ended March from a year earlier, compared with 6.1 percent in the previous quarter, the Central Statistical Office said in a statement in New Delhi today. The median of 31 estimates in a Bloomberg News survey was for a 6.1 percent gain. GDP climbed 6.5 percent in the year to March, the office said. Singh faces a struggle to bolster expansion as Europe’s debt crisis dims the global outlook and elevated inflation and a record trade deficit limit room for interest-rate cuts to boost spending at home. Discord in the ruling coalition and claims of graft have impeded his push to open up the economy, damping investment and sending the rupee to its lowest level today. Ten-year government bonds rallied the most in three weeks, with the yield on the 8.79 percent note due November 2021 dropping 15 basis points, or 0.15 percentage point, to 8.38 percent. The rupee touched an unprecedented low of 56.515 per dollar before strengthening to close 0.2 percent higher at 56.11. It has slumped 20 percent in the past year. The BSE India Sensitive Index (SENSEX) of stocks fell 0.6 percent. The rise in full-year GDP compares with the 6.7 percent median estimate in a Bloomberg survey and 8.4 percent in 2010- 2011. India’s goal is 9 percent annual expansion in a nation where about two-thirds of the population still lives on less than $2 a day, according to World Bank data. Policy gridlock has contributed to slower investment, which Morgan Staley estimates fell to 34.4 percent of GDP last fiscal year from 38.1 percent in 2007-2008. Manufacturing fell 0.3 percent in the three months through March from a year earlier, compared with a 0.6 percent gain in the previous quarter, today’s report showed. Farm output grew 1.7 percent, while construction climbed 4.8 percent. Growth has also slowed in emerging nations from China to Brazil because of Europe’s crisis, which has damped demand for exports and reduced appetite for developing-nation assets. Reserve Bank of India Governor Duvvuri Subbarao has pledged to take steps as needed to curb swings in the nation’s currency. Its weakness threatens to stoke inflation by raising import costs. The pace of price increases climbed to 7.23 percent in April, the fastest among the largest emerging economies. The trade deficit in Asia’s third-largest economy widened to a record $184.9 billion in 2011-2012, fanning concern about whether India can attract enough foreign capital to fund the excess of imports. Finance Minister Pranab Mukherjee is also trying to narrow the budget deficit to 5.1 percent of GDP in the year that began April 1, from 5.9 percent, in part by limiting subsidies. Some spending plans for the current fiscal year have been reduced by 10 percent as part of austerity measures, the government said separately today. The GDP data are “disappointing,” Mukherjee said in a statement in New Delhi, adding the administration will take “all necessary steps” to address fiscal and trade imbalances. The central bank has signaled government spending, the rupee’s drop and energy costs may curb scope for more rate cuts. It lowered the benchmark rate to 8 percent from 8.5 percent on April 17, the first cut since 2009, after increasing it by a record 3.75 percentage points from mid-March 2010 to October last year to try and contain inflation. The government’s setbacks include the suspension in December of plans to allow foreign companies to open supermarkets in India after a coalition partner objected. The prime minister defended India’s record earlier this month, saying GDP rose at one of the fastest paces in the world last fiscal year. Singh added he is “confident” of proving wrong skeptics who doubt India can sustain economic momentum. The Reserve Bank projects 7.3 percent growth in 2012-2013, driven by the spending power of 1.2 billion people. Goldman Sachs Group Inc. downgraded its growth projection for the country on May 25, predicting a 6.6 percent GDP increase this fiscal year, down from 7.2 percent. It pared its outlook for further rate cuts to 50 basis points in 2012 from 75 points. Some companies have been affected by slower expansion. Tata Steel Ltd., India’s biggest producer of the alloy, reported a 90 percent drop in profit in the three months through March. India may face a difficult period of low growth and high inflation known as “stagflation,” said Hemindra Hazari, Mumbai-based head of research at Nirmal Bang Securities Pvt. 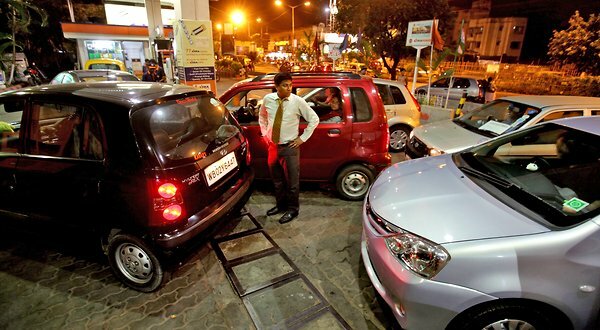 India's main opposition parties are organising a nationwide strike against a big rise in petrol prices. People are also upset about the general economic slump. In 2012, growth fell to 6.9 per cent, down from 8.4 per cent last year. Tax revenues have also dropped by 2.5 per cent, and the rupee recently slumped to an all-time low against the dollar. Critics say that parliament has failed to quickly pass financial reforms, and that the government has not been able to muster up enough support from its coalition partners to pass major bills. Al Jazeera's Prerna Suri reports from New Delhi. MUMBAI — India’s growth rate fell to its slowest pace in almost a decade last year, according to government estimates published Thursday, putting further pressure on a fractured coalition government in New Delhi that has been widely criticized for its management of the economy. India’s economy grew 6.5 percent in the fiscal year that ended in March, down from 8.4 percent the year before, as sectors like manufacturing, mining and agriculture did poorly. In a worrying sign for the rest of this year, the report showed a sharp drop-off in economic activity in the first three months of 2012, with growth falling to 5.3 percent, from 9.2 percent a year earlier. Analysts were expecting India’s growth rate to slow because of a contraction in new investments by the private sector and the financial effects of the crisis in Europe, but the numbers were worse than predicted. Moreover, more sectors exhibited slower growth, raising new concerns about the economy. The full-year growth number was below the country’s growth rate during the financial crisis in 2008-09, when India grew at 6.7 percent. The last time India grew at a slower pace was in the 2002-03 fiscal year, when it registered a 4 percent pace. Analysts say it will be harder for Indian policy makers to respond to a slowing economy now than during the financial crisis more than three years ago. At that time, the government’s finances were relatively healthier and it was able to spend money to stimulate the economy. Now, however, New Delhi is desperately trying to cut its fiscal deficit from 5.9 percent of its gross domestic product to 5.1 percent. Also, the Reserve Bank of India has less room to cut short-term interest rates to stimulate lending because inflation remains high, at about 7 percent. Many analysts have been arguing that the best way for policy makers to respond to slowing growth is further liberalization of India’s economy, large parts of which are still heavily regulated. The government could, for instance, make it easier for foreigners to invest in industries like retail, aviation and insurance that need more capital. But the government, led by the Indian National Congress Party, has struggled to pass unpopular measures in recent months because of opposition from its coalition partners and political rivals. Last year, it indefinitely deferred a plan to allow foreign supermarkets into the country after a coalition partner threatened to pull out if the change went through. On Thursday, much of India was shut down in protest against a sharp increase in petroleum prices by government-owned oil companies. Policy makers said the increase was needed to offset the rising cost of oil imports, which have become more expensive as India’s currency, the rupee, has fallen sharply against the dollar. In New Delhi and Mumbai, normally traffic-clogged roads were largely empty Thursday afternoon. The benchmark Nifty stock index was down about 0.7 percent at 2:45 p.m. local time. The rupee was trading at 56.175 to the dollar after crossing 56.5 earlier in the day. As recently as February, the rupee was trading about 49 to the dollar. SHANGHAI (AP) — Dismal data from China and India on Friday may signal a further weakening of the global recovery, undermining hopes the dynamic emerging economies of Asia can help prop up growth. China reported its industrial production rose 9.3 percent from a year earlier in April, below expectations and down from nearly 12 percent in March. Investment and retail sales also slowed, though easing inflation offers leeway for fresh moves to boost growth. India's industrial output fell 3.5 percent in March from a year earlier on weak manufacturing and investment. Output for the fiscal year ending in March rose 2.8 percent, down from 8.2 percent the year before. The anemic indicators suggest Asia's ability to counter slowing growth in Europe may be limited. It also shows that the brief burst of vitality partly fueled by European stimulus late last year is likely wearing off. "It's possible we're seeing the tailwind fall out of that," said Tony Nash, managing director at IHS Global Insight in Singapore. "We've been looking for more easing. It might start any time given these numbers." Already, commodity prices are falling as China's slowdown bites into demand for oil, industrial components and consumer goods at a time when U.S. and European growth are weak. Friday's data are especially troubling because they indicate weakening domestic demand in India and China, markets many had looked to hopefully as bastions of growth in the faltering global economy. "Things look very shaky in Europe and the U.S. economy is decelerating. The last thing we need is for the emerging world to downshift. Unfortunately the data today points in that direction," said Frederic Neumann, co-head of Asian economics research at HSBC in Hong Kong. "We fear that without further stimulus India and China will continue to slow," he said. China's economy grew 8.1 percent in the first quarter of the year, a still robust rate but its slowest pace since 2009 and below the previous quarter's 8.9 percent. Friday's news dashed hopes the slowdown might have bottomed out. "In India and China we expected exports to slow given the trouble in Europe. For both, Europe is a bigger export market than the U.S. The bigger surprise is the weakness on the domestic side," said Neumann. "It was the Chinese consumer we had banked on to carry the global economy forward," he said. China's leaders face a challenge in keeping politically sensitive inflation under control while spurring growth. Growth has fallen steadily since 2010 as Beijing tightened lending and investment curbs to cool an overheated economy and surging inflation, so slowing output and investment figures are not all that surprising, said Nash. "It's just that with these global headwinds, this is a difficult time for China to be going through this transition," he said. Last year's drop in demand for China's exports due to U.S. and European economic woes prompted Beijing to reverse course, easing controls on bank lending to help struggling manufacturers. Most analysts expect the central bank to cut bank reserve ratios again soon, freeing up more money for lending. "We are still optimistic that China will pick up later in the year, especially since low inflation gives policymakers room to loosen policy further," said Daniel Martin, an economist with Capital Economics in Singapore. "This should support global demand, even as the eurozone remains mired in recession," he said. The stimulus versus inflation dilemma is more acute for India, where the central bank faces enormous political pressure to stoke growth, despite persistent inflation and soaring deficits. "It is very disappointing," Chakravarthy Rangarajan, chairman of the Prime Minister's Economic Advisory Council, said of Friday's data. "One had not expected such a sharp decline." Concerns about governance and policy uncertainty are weighing on investment, while India's twin current account and fiscal deficits have alarmed economists and punished the rupee. Hong Kong, meanwhile, reported Friday that its first-quarter economic growth stalled, expanding only 0.4 percent, as exports shrank. The government of the southern Chinese financial center warned Friday of further risks from the European debt crisis. The news from Asia is not entirely bad, though. Indonesia, Southeast Asia's biggest economy, is still growing at a 6 percent pace. Across the region, authorities have eased monetary policies to counter feeble European demand and spur growth. Japan, Asia's second biggest economy, saw its industrial output rise 1 percent in March, helped by a recovery in household spending. Rebuilding in areas devastated by the March 11, 2011 tsunami also could help support industrial production despite weak global demand. Business writers Erika Kinetz in Mumbai and Kelvin Chan in Hong Kong contributed to this report. NEW YORK (CNNMoney) -- India's economic growth slowed sharply in the first three months of 2012, due primarily to weakness in its manufacturing and agricultural sectors. The Indian economy grew at a 5.3% annual rate in the first three months of the year, the Ministry of Statistics and Program Implementation said Thursday. The growth was a significant slowdown from the 6.1% rate in the final three months of 2011. Finance Minister Shri Pranab Mukherjee called the figures "disappointing," but also said they "have to been seen in the light of overall global developments." India is the world's second most populous nation after China, and the 11th largest economy, falling just behind Canada in output. An emerging economy, its growth is often choppy, but far faster than that of western countries. In the first quarter, the country's manufacturing sector contracted and its agricultural sector slowed substantially. Spending by both consumers and the government decelerated slightly. Mukherjee also blamed the recent slowdown partly on tighter monetary policy. The Reserve Bank of India, the country's equivalent of the Federal Reserve, has held interest rates high for three years to battle rapid inflation in the country. Last month, it acted to lower that rate slightly to try to stimulate economic growth. Weaker economic growth in the first quarter is likely to put more pressure on the central bank to lower rates further. India's inflation unexpectedly accelerated in April to over seven percent, data showed on Monday, sharply reducing the central bank's scope to cut interest rates to boost a stumbling economy. The closely watched Wholesale Price Index jumped to 7.23 percent from the same month a year ago with food prices climbing by over 10 percent, the commerce ministry said. March inflation was 6.89 percent. The disappointing numbers helped push India's currency to a record low close of 53.92 rupees to the dollar while the stock market shed half a percentage point to finish at a four-month trough of 16,215.84 points. The inflation data was another reminder that Asia's third-largest economy is in trouble after figures last week showed industrial output shrank by a surprise 3.5 percent in March due to weak domestic demand and falling exports. "Inflation is alive again. The central bank is staring at an economy posting below-trend growth and still-high inflation," said CLSA economist Rajeev Malik. "It is best not to expect much in terms of rate cuts." The central bank in April started unwinding a string of aggressive rate hikes, cutting borrowing costs by a surprisingly large half-percentage point, as inflation edged down from 2011's near double-digit levels. But with Monday's price numbers, the central bank's generous rate reduction looked premature, economists said, with India facing potential "stagflation" -- a dismal scenario of slowing growth and high inflation. The central bank now has to decide whether to cut rates further to spur growth or wait and watch, economists said. The central bank has "already given a big rate cut dose", Dharmakriti Joshi, chief economist at leading Indian ratings agency Crisil, told AFP. "They'll hold on some time to see how inflationary pressures evolve and then take a decision on how they can support growth," he said. Rising inflation is a major threat to the popularity of the Congress-led government, whose main supporters are India's hundreds of millions of poor, and which is already tainted by a stretch of corruption scandals. Finance Minister Pranab Mukherjee isolated "food inflation as a matter of particular concern, especially as it has reached double-digits". Foreign investors, meanwhile, are dismayed over India's ballooning trade and fiscal deficits and graft scandals that have stalled vital reforms needed to liberalise the still-inward looking economy and quicken growth. The government estimates India's economy grew by 6.9 percent in the fiscal year to March 2012 -- the weakest clip since the 2008 global financial crisis -- and it expects expansion to be 7.6 percent this year. But many economists expect this year's expansion to be much lower, in the six-to-seven percent range, a level judged by experts as insufficient to start significantly reducing India's poverty. India's weakening performance comes as global investors look to Asia to revive the international economy with the eurozone debt crisis deepening. The proposals were announced as part of India's federal budget last month. The government has been involved in a long-running fight over taxes with the London-listed Vodafone group. 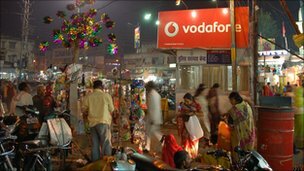 In January, the Supreme Court ruled that Vodafone was not liable for taxes and penalties of up to $4.4bn (£2.8bn). The company was presented with a tax demand of 112 billion rupees, currently worth $2.2bn. The Indian government subsequently sought penalties of up to 100% of the original bill. The letter to Prime Minister Singh was signed by seven leading industry associations from the US, UK, Japan, Canada and Hong Kong. The list of associations comprises Canadian Manufacturers and Exporters, the Capital Markets Tax Committee of Asia, the Confederation of British Industry, the Japan Foreign Trade Council, the National Foreign Trade Council and the United States Council for International Business. Together they represent more than 250,000 companies, including several top global corporations. "The sudden and unprecedented move in the Bill [Indian budget] has undermined confidence in the policies of the government of India toward foreign investment and taxation and has called into question the very rule of law, due process, and fair treatment in India," the letter said. "This is now prompting a widespread reconsideration of the costs and benefits of investing in India," it said. The letter said some member companies had "already begun re-evaluating their investments in India due to increasing levels of controversy and uncertainty regarding taxation in recent years". "India will lose significant ground as a destination for international investment if it fails to align itself with policy and practice around the world," it added. Speaking during a visit to Delhi on Monday, Britain's Chancellor of the Exchequer (finance minister) George Osborne said the tax proposals were a concern and might damage India's investment climate. Analysts say sluggish investment is to blame for the slowing growth of India's economy - the country registered 6.1% growth in the December quarter, the lowest in nearly three years.